When completed in November this year the Curepe Interchange will significantly alleviate traffic for those travelling from the East into Port of Spain. The Curepe Interchange will reduce morning delays on the Churchill Roosevelt Highway (CRH) from about 11 minutes per vehicle to 19 seconds. In the afternoon delays will decrease from about 22 minutes per vehicle to 19 seconds. The Southern Main Road traffic flow will also improve in the morning going from about 9.5 minutes per vehicle to 35 seconds per vehicle. The afternoon commute will be reduced from 21 minutes per vehicle to about 1 minute. Prime Minister Dr the Hon. Keith Rowley turned the sod for the project today (20.02.2019) at an event hosted by the Ministry of Works and Transport, in collaboration with the National Infrastructure Development Company (NIDCO). The Curepe Interchange project is part of a larger scope of improvement initiatives currently being implemented by the Ministry of Works and Transport under the larger East-West Corridor Transportation Project. When all works are completed traffic lights from Port of Spain to Sangre Grande along the Churchill Roosevelt Highway will be removed. The Curepe interchange project involves the construction of an overpass with two cloverleaf sections at the intersection of CRH and Southern Main Road Curepe. 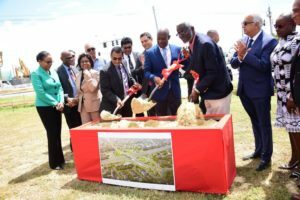 It also includes the construction of the associated frontage and connector roads within the area north and south of the CRH from Prince Charles Avenue, Valsayn to the intersection of the SMR. The Key project stakeholders are the Ministry of Works and Transport, NIDCO, Planning Associates and China Railway Joint Venture. The joint venture is an amalgamation of both Chinese and local contractors. Reduced traffic congestion when the interchange and ancillary works are completed it is expected that travel time along the CRH will be reduced. Boost to the local economy. Major activity is expected during the construction phases of the project bringing with it commercial opportunities for small contractors, skilled and unskilled labours and the business community.